The Mischievous Mom at the Art Gallery features a thoroughly modern mother who makes a point of including her two children in her always-hectic life. In The Mischievous Mom at the Art Gallery, Mom takes her children to a swanky art gallery party. Although Jessie and Josh think standing around looking at art on a wall is B-O-R-I-N-G, they quickly learn otherwise. Nothing is ever really boring when Mom is around - especially when a "Do Not Enter: VIPs Only!" sign beckons. Behind that door is a world of adventure just waiting to be discovered. This book is for modern moms and their children - and for anyone who knows that not being afraid to think outside of the box can lead to the most memorable experiences of all. About Erica Ehm (Author) : Erica Ehm is a published author of children's books. 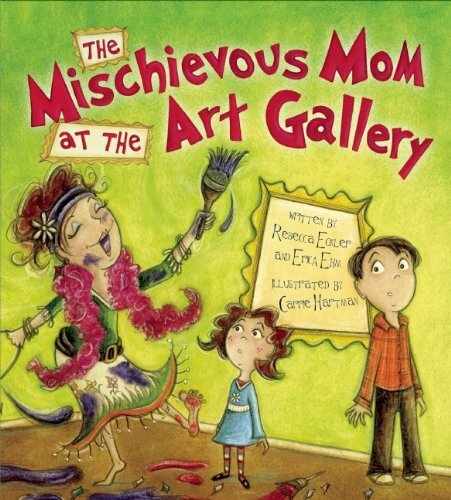 A published credit of Erica Ehm is The Mischievous Mom at the Art Gallery. About Rebecca Eckler (Author) : Rebecca Eckler is a published author of children's books. A published credit of Rebecca Eckler is The Mischievous Mom at the Art Gallery.